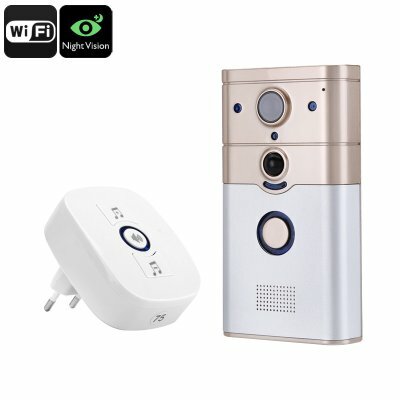 Successfully Added Video Doorbell Intercom - 1/4 Inch CMOS, 720p Video, Night Vision, IR Cut, PIR Sensor, 100-Degree Viewing Angle, Remote Access to your Shopping Cart. This video doorbell intercom provides you with an affordable way to significantly upgrade your home security. Featuring a built-in 720p camera, this intercom allows you to instantly check who’s at your door via your smartphone or portable computer. Its 1/4 Inch CMOS produces HD footage at all time that clearly lets you recognize the person in front of your door and with its 100-degree viewing angle, you can be assured that you’ll get a full overview of all that’s happening outside before you open up for any stranger. Perfect for increasing the overall security of your home or office along with that of all your property and your loved ones – this wireless video doorbell is the perfect smart home accessory. Supporting both WiFi and wired internet connectivity, this wireless doorbell intercom can be easily paired with your network connection and accessed from afar. When used with the dedicated mobile Application you’ll be able to enjoy live footage of all that’s happening in front of your home’s entrance on your smartphone or tablet PC without you needing to be physically present. Its dual-way audio support additionally lets you talk with your visitors by simply using your mobile device. Supporting 5 online users at once, this video doorbell allows the entire family to make use of its amazing smart doorbell features at once. Featuring three IR LED lights, this wireless doorbell is capable of providing you with clear and detailed images at both day and night. IR cut makes sure that its night vision mode gets activated automatically whenever natural light runs low, guaranteeing that you’ll always be able to see who’s in front of your door. Additionally, this intercom doorbell furthermore packs a high-end PIR sensor that is capable of detecting the slightest of human movements in front of your property. By allowing you to set a motion detection alarm, you’ll always stay informed on when somebody is approaching your door even when you’re not actually there. This video doorbell intercom comes with a 12 months warranty, brought to you by the leader in electronic devices as well as wholesale electronic gadgets..